Tasteful and comfortable is how Casa del Saraceno, situated on a slope above the sea, presents itself. 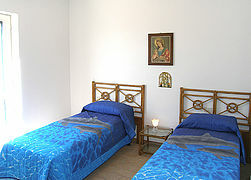 The lovely holiday retreat for 4 persons lies somewhat above the fishing village of Marina di Pisciotta. 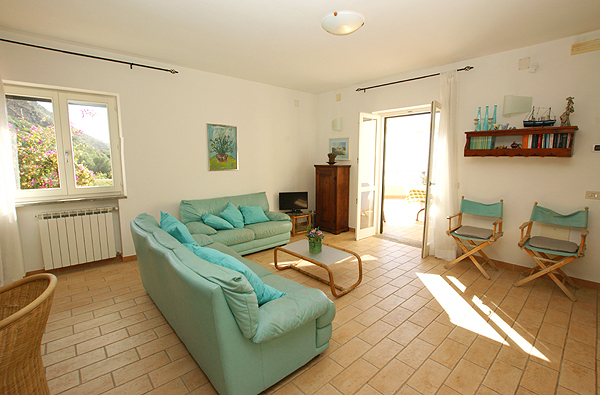 The holiday apartment wins you over not only with its interior furnishing. 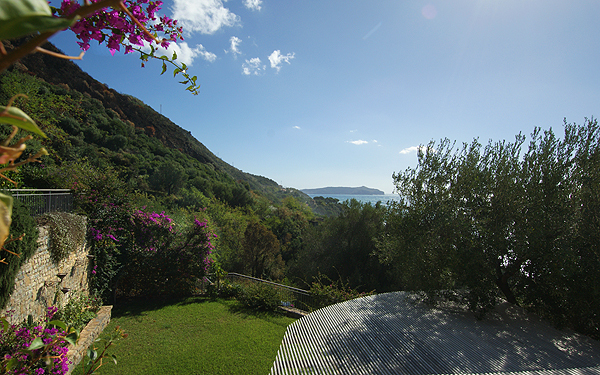 From the 40 m², L-shaped terrace you have got a fantastic view of the sea and of Capo Palinuro. It is, without doubt, the heart of Casa del Saraceno. The spacious living-dining area with integrated kitchenette radiates a pleasant atmosphere and offers access of the terrace. The couch 'corner' with TV held in pastel colors invites you to relax; tasteful rattan furniture in the dining area make for the right ambience to savor delicious Cilento specialties and your own dishes. The two bedrooms, a double and a twin, are airy and bright. 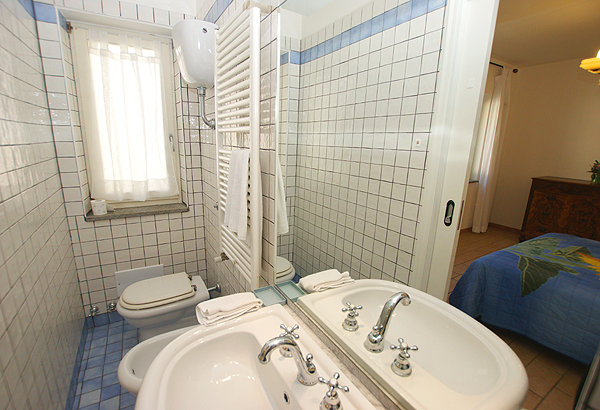 The double bedroom has an en suite bathroom with shower, bidet and WC. 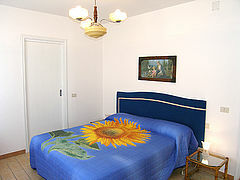 The twin bedroom opens onto the terrace. 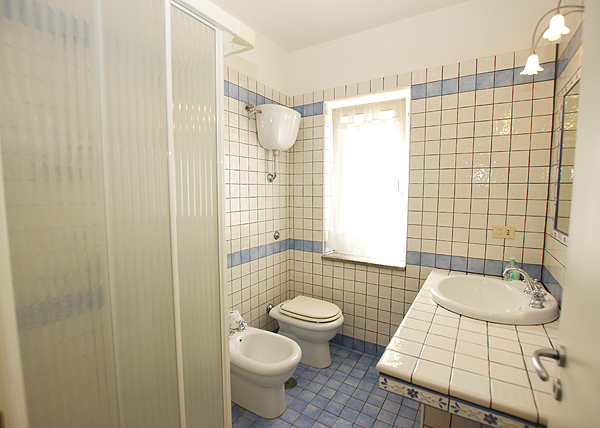 A second bathroom, also with shower, bidet and WC, is accessible from the hallway. 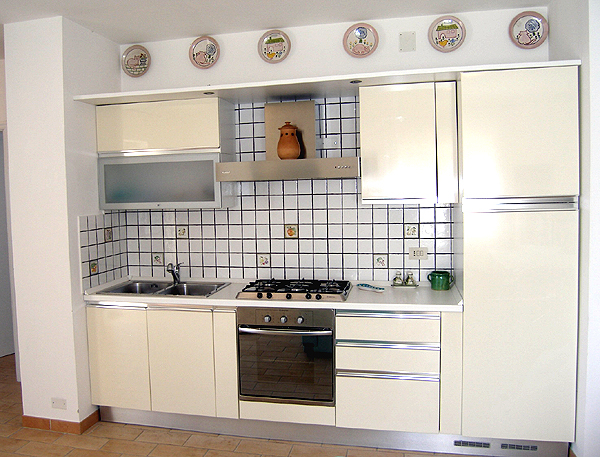 Casa del Saraceno is furnished with a washing machine, which is very convenient, and with central heating, which makes it suitable for a stay in winter. Your outdoor area includes part of the terraced garden. Parking is available in front of the entrance gate or in a parking space along the small street. The holiday apartment is at a straight-line distance of 200 m from the sea. 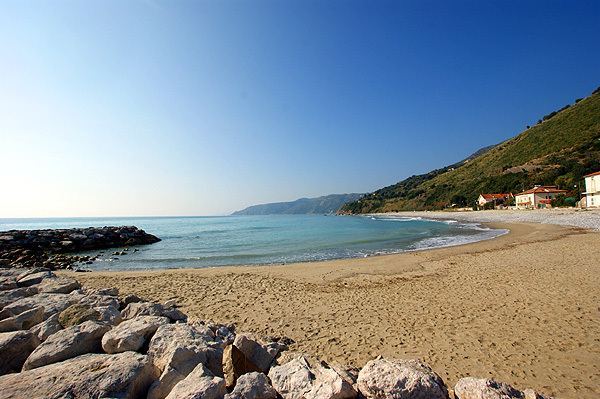 The sandy beach of Marina di Pisciotta is at a walking distance of about 1 km, by car it is about 1.5 km. Do you prefer sandy beaches? A short drive towards Palinuro takes you right to Caprioli’s Saline beach, where you can sunbathe, bathe, swim, relax or take a walk towards the Cape of Palinuro. At the headland, which is the Cape of Palinuro, a Blue Grotto lies hidden, similar to the one on Capri. 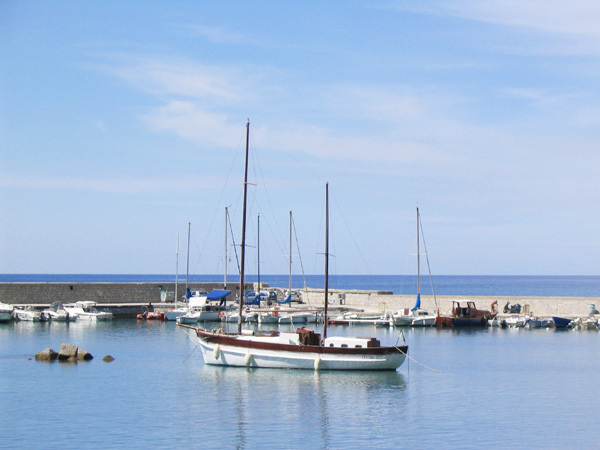 The Cooperativa at the harbor of Palinuro takes you into the sea grotto with small wooden boats. The nearest shopping facilities, restaurants (open, in general, from April to October) and café bars are found at Marina di Pisciotta, too. 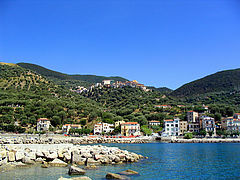 It is a 1.5 km walk along a stepped path or a 3 km drive by car to the picturesque mountain town of Pisciotta. In the medieval center of Pisciotta, restaurants Osteria del Borgo and I Tre Gufi are, apart from a few weeks, open year-round. There are also several small supermarkets and greengrocers at Pisciotta. 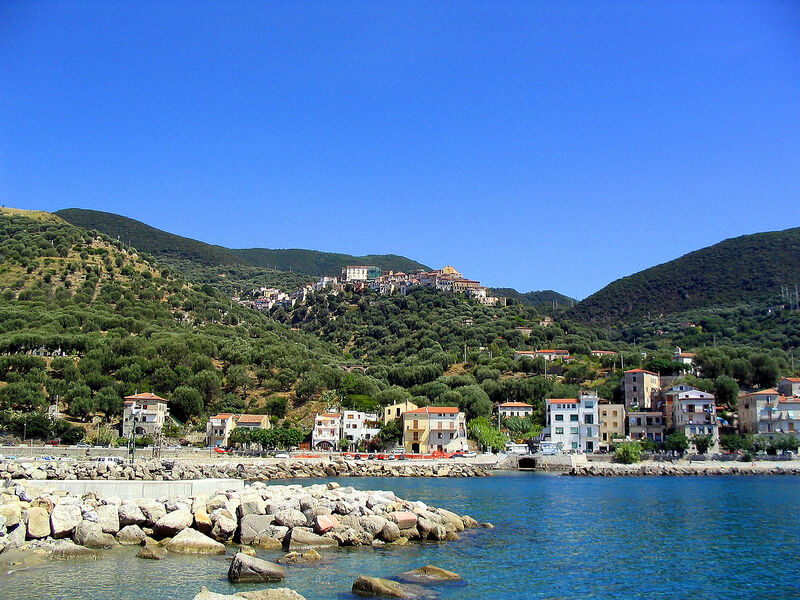 Nearest train station: Pisciotta-Palinuro (ca. 1 km). Terrific view of the sea from Casa del Saraceno. Make yourself comfortable on the large terrace and enjoy the unobstructed view of the sea. The spacious living area with kitchenette, dining furniture and sofa corner offers access of the large sea view terrace. From the living room window you can see famous Cape Palinuro. The beautiful sea view terrace runs elegantly along two sides of the holiday apartment. The living-dining area with kitchenette. 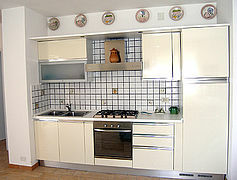 The kitchenette of Casa del Saraceno. 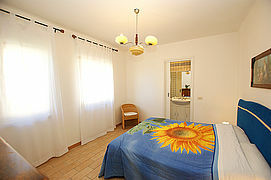 The double bedroom with en suite bathroom. Friendly and bright: the twin bedroom at Casa del Saraceno. 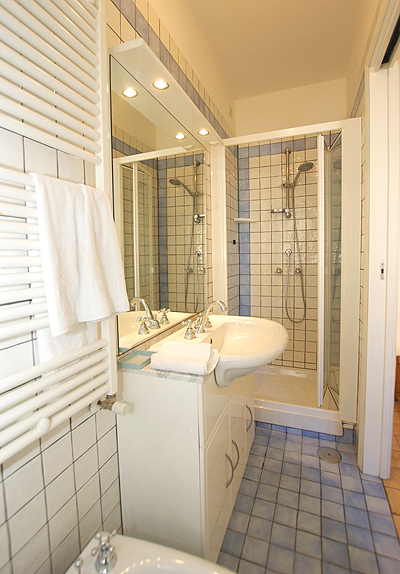 Glance into the larger bathroom, which is accessible from the living area. 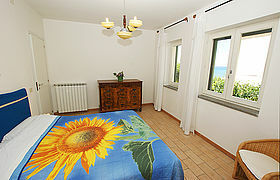 From the double bedroom you have even got a view of the sea. 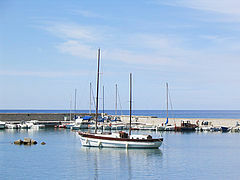 The fishing village of Marina di Pisciotta is famous for its Alici di Menaica (anchovies à la Menaica). Fishing used to be the Cilentani’s main source of income. 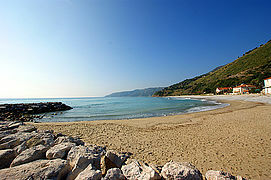 The lovely beach (partly sand, partly pebble) of Marina di Pisciotta is within walking distance. Wir waren rundum zufrieden mit unserer Ferienwohnung. Vor allem die Terrasse, die Ausstattung und die fußläufige Erreichbarkeit des Dorfes haben uns besonders gut gefallen! Auch die Region an sich fanden wir sehr schön! Wir können uns gut vorstellen, nochmals hierher zu kommen! Die Ferienwohnung hat uns aufgrund der tollen Lage, der guten Raumaufteilung und der Terrasse sehr gut gefallen! Man kann hier sowohl wandern und baden, eine perfekte Kombination. Wir haben hier einen schönen Urlaub abseits des sonstigen Tourismus-Trubels verbracht, den wir gerne wiederholen werden! Eine sehr gut ausgestattete Ferienwohnung mit einem fantastischen Meerblick! Wir kommen wieder weil uns die wunderschöne Landschaft, die Wanderwege und die tollen Strände sehr gut gefallen haben! Wir waren begeistert: eine hervorragende Ferienwohnung mit hochwertiger Ausstattung und tollem Meerblick! Besonders gut gefallen haben uns auch das sehr saubere und warme Meer sowie die abwechslungsreichen Strände. Unser Fazit: Meer, Strände, Essen, Ferienwohnung – alles top! Erholung und Ruhe inklusive! Wir werden wiederkommen! Es hat mir hier wirklich gut gefallen: Die Strände waren leer und das Wasser sehr sauber. Die Terrasse von Casa del Saraceno bietet eine wunderschöne Aussicht. Possible costs for heating are charged on the spot according to use.